The PETOL™ FLANGE SPRAY DEFLECTOR minimizes the spray produced when a flange set is broken open and allows the operator to direct the spray into a known direction. This device is designed to help protect the worker from the dangers of chemical exposure, hot water and/or steam burns caused by the spray of liquid or gas under pressure when unbolting flanged connections. Suitable applications for this tool include: first line breaks, low point breaks, hot bolting, blinding, and draining deflection and/or guiding. 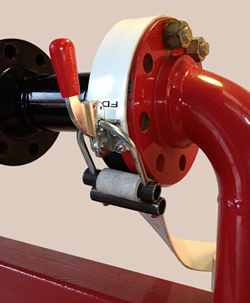 The PETOL Flange Spray Deflector’s simple design consists of a nitrile elastomer strap, tension adjustment bolt and a tension clamp. The flange spray deflector is not intended to seal or contain any pressure or replace any personal protective equipment (PPE). PETOL.FD1 2" 22" 2 lbs. PETOL.FD2 2" 45" 2-3/4 lbs. Improper use of the PETOL™ Flange Spray Deflector may result in INJURY OR DEATH! Read Operating Instructions prior to operation. This device is not intended to replace any personal protective equipment (PPE). Before using, inspect the strap for cuts, tears, burns or damage and replace or return any damaged tool. Do not use to seal or contain any pressure. Do not use for lifting or support of any load. Do not use to hold flanges in alignment. Do not use to support an unbolted line, blind, valve or fitting. Do not use on surfaces that exceed 275° F.
Follow OSHA, NSC, etc., standards, safe practices, and procedures.